The youths worked with their parents to create "an original lunch recipe," Ms. Obama stated in a letter announcing the dinner. The luncheon is Ms. Obama's latest public effort to serve up healthy eating and healthy lifestyles as an example Americans, and especially children, should strive to adopt. This is the latest in the First Lady's push to promote healthy living for children. In addition to her gardening work, she has her "Let's Move!" program, an initiative to combat childhood obesity; she has taken part in numerous activities with kids, including doing jumping jacks with a flash mob; and she has been actively working for healthier school lunches. 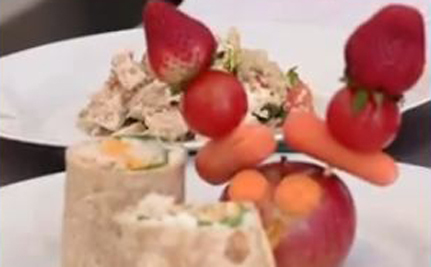 The Kids' State Dinner came out of a contest where children were invited to submit original, healthy recipes. A panel of judges from the Department of Agriculture, the Department of Education, and the food-focused website Epicurious selected 54 of their favorite recipes: one for each state, territory, and the District of Columbia. The winners of the more than 1,100 entries, along with their mothers, were the guests in the East Room of the White House, where the food was served on historic china from the Reagan administration. Is this not cool?” asked Mrs. Obama, in a green Barbara Tfank dress and pearls. “This is one of the best events we’ve ever done. She pointed out some of the more creative recipes, such as the “Secret Service Super Salad” submitted by 9-year-old Michael Lakind of Texas, who said he wants to be an agent someday. Ellen Goldsmith-Levitt of Massachusetts attended with her daughter, Rachel, who won for her goat-cheese sandwich. They said they enjoy making pastas and soups together. “She just came out a foodie,” the mother said. The Kids' State Dinner is a White House original in many ways -- it's not only the first time the guests of honor are ALL under the age of 13, it's also the first time the White House kitchen has served a formal meal where the entire menu was created by "chefs" who have no formal training. But Executive Chef Cris Comerford and Executive Pastry Chef Bill Yosses say they learned a thing or two about healthy cooking from the young winners of the Healthy Lunchtime Challenge. The White House plans to make a free printable and downloadable cookbook with the winning recipes. Is First Lady Michelle Obama not cool?